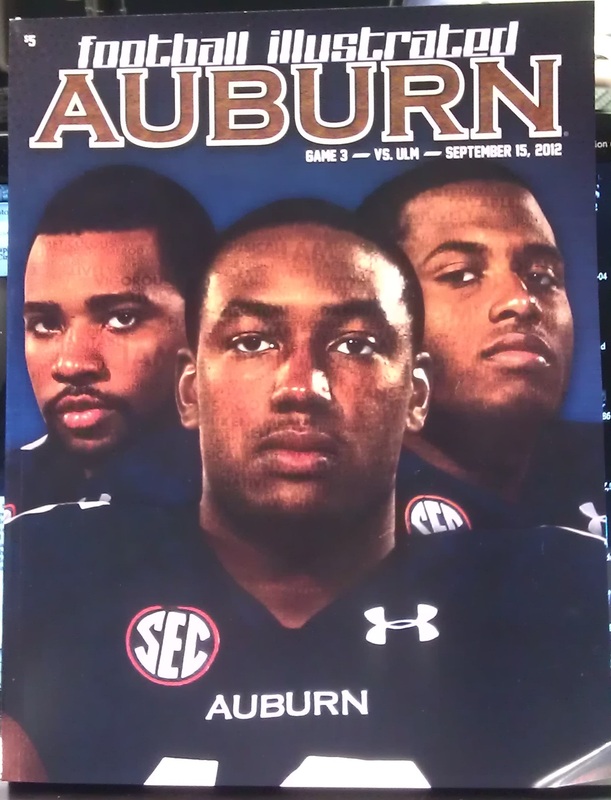 It’s hard to make out in this shot, but subtly superimposed over the faces of Auburn seniors Ashton Richardson, Ikeem Means, and Anthony Morgan, the three Auburn senior featured on the first 2012 issue of Auburn Football Illustrated are “words that reflect who they are as individuals,” according to the program’s content page. For example, in case you couldn’t tell already, Ikeem Means is, among a zillion other things, organized, musical, smart, agile, and, of course, dashing. Anthony Morgan is generous, corny, tidy, etc., while lively homebody Ashton Richardson is both meticulous and vigorous. Related: Commemorative Phil Neel poster included in Auburn vs. La-Monroe game program.